This is one of the pairs of gift socks I made for this Christmas (will be distributed late, sadly), and while I think the recipient will be pleased with them and wear them without concern, I’m a little embarrassed to be handing over a pair of socks that quite frankly does not match at all. Both of these skeins were from the recently-added line of Knit Picks Essential Kettle-Dyed yarn, a yarn which is the same as their Essential sock yarn but dyed with a kettle-dye method. While they do warn on their site that this can result in variations between skeins, I’d like to think they would try to produce a little less variation than this – one sock looks like a solid blue, the other a highly variegated blue colourway. Even if I were to have approached this by alternating skeins on the same project, this level of difference would have given me something more like stripes, not a blended semi-solid effect. Needless to say, I won’t be buying this yarn again. I think the extra savings isn’t worth it if the final product doesn’t give you what you want. Me, if I want a kettle-dyed effect, I’ll stick with Malabrigo sock or Araucania Ranco or something similar – the skeins are big enough for a full pair between them and I won’t end up with this kind of problem. For solid shades I don’t mind the regular Essential (it’s made several gifts for me in the past), but I’m not sure this ‘kettle-dye’ variation is worth it in the long run. And I’ll also be investigating some yarn another pair for R, who deserves a pair of socks that match! Hope your Sunday is going well. I have been struck by the sniffles and will be having a low-key day today. Thankfully with some knitting close by. You can always overdye them if it bothers you that muchs…. Yeah, KnitPicks is a site that I’m ambivalent about as well. I love their needles, their yarn is cheap, but some of their projects and colorways do not last long enough for me to decide whether I want to make it. Yes, I’ve decided life is just too short for cheap yarn, or at least yarn that isn’t good quality. I mean, when you consider how much (or little!) time one has for knitting and how much time and effort goes into a handknit, it’s totally worth the money spent on good yarn. I made a sweater for my dad out of Knit Picks WOTA because he is neither short nor skinny and it took a lot of yarn and I didn’t want to spend 100 bucks. But it also took a whole lot of time! He loves it, but it’s all pilly and fuzzy and now that I know better, I think I should have spent the money on nicer wool. With a result like that in one pair of socks, I do understand your decision not to use that woolblend again, you would surely have to change your blogname 😉 . Wow! Thanks for getting the word out. I came very close to ordering a few balls for some gift knitting but I kept reading that warning over and over and kept thinking how different could they be?! Thanks for answering that question! I know what you mean about Knitpicks. The sample projects and kits have a sort of ‘crafty’ vibe that make me nervous. Plus your example of the totally different sock yarn, ugh. I agee with the susan about not wasting time knitting with poor quality wool. the last cardigan I knit with some cascade 150 started pilling immediately and now can only be worn at home. I agree, on the kettles. Malabrigo or my own (then lack of matching can be my fault) for colour variations of that sort. Though I love the needles and rather like their bare yarns. Hey, for the pilling problem you can get one of those little shaver things. I seem to remember the explanation is that shorter fibres of wool are not always nicely spun up, and when these little bits get a chance, they’ll just cling together in these little balls. Shave these off, and you have a nice jumper again (and it should not compromise the structural integrity of your garment. As in: it won’t fall apart). There is (oh irony) a KnitPicks podcast from last year where they talk about this and many other interesting tools. Interesting. The solution from their perspective could be to double the size of the skeins, so even if there is huge variation between skeins you could get a whole pair out of each one. I wonder why they sell such small skeins. Thanks for pointing that out. I’m with you. I really like the Shine series of KP cottons but all their wool is cheap and unreliable. I’ve found WoTA to bleed, pill and be full of knots. 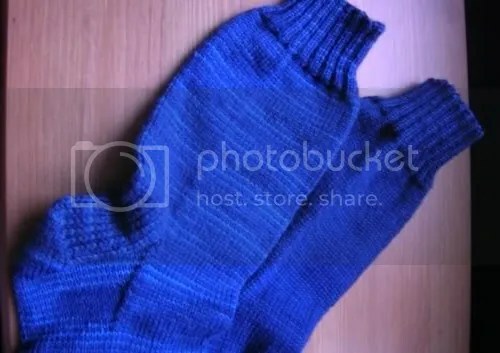 I recently abandoned a pair of socks with one sock entirely knit because I just hated the squeaky Essential yarn. Also, someone needs to tell KP to stop marketing their stuff to people who like Red Heart. Have you seen their mail catalog? Ack! It’s atrocious. If you want socks that have the tonal varietaion, check out some of ShiBui sock yarn, http://www.shibuiknits.com/Yarn/Colorways.php?Yarn=9 They have wonderful coloring and the yarn is amazing. I was actualy just thinking recently I might order some yarn off knitpicks. i will keep it in mind to check the skeins before I use them. I just got the harmony interchangable cir’s for christmas and I’m in love with them!! There are two full pages of comments and interesting to read. Thanks for the heads up about the kettle dyed essential. I’ve been looking at it but hadn’t ordered any. I wish they’d just make bigger balls with their sock yarns also but understand why they have them 50g… perhaps they could offer both. someday. Tea + knitting + a good book/movie = my favorite cure for a cold. I’m in the same (sniffly) boat as you, and I’m happy to have MLK day off to recover. Oh my. I would be unhappy with those results too. Being Canadian I favour Elann dot com. BUt their web site page is not as easy to navigate as KP. That is weird – thanks for the tip about the kettle-dyed yarn. I had been looking at it, and now I think I won’t bother. I knit with their Felicia and the stripes have always matched totally (as long as I am careful to start the 2nd sock from the 2nd skein in exactly the right point to make the match).